- Jobbridge, through a positive frame. COVER PHOTO: Philip McMahon, Dublin, in action against David Moran of Kerry in the Allianz Football League Division 1, Round 1 game in Croke Park, Dublin, on Feb. 1st. Photo: Brendan Moran/SPORTSFILE. FRONT & ABOVE: Inishbofin pics courtesy Marie Coyne: www.facebook.com/InishbofinHeritageMuseum. King’s Island flooded hallway, courtesy Diane Ryan. Darragh CliffordCronin from Cratloe, Co. Clare, was on work placement for a fortnight in February with ‘Changing Ireland’. He carried out interviews on King’s Island that contributed to our coverage on pages 13-16. He also filmed there and his video reports from King’s Island can be viewed on ‘Changing Ireland’s Youtube Channel. Darragh also conducted an interview with the manager of Athlone Community Radio (page 24). He is a student of Limerick College of Further Education. The Local and Community Development Programme (LCDP) is the main community development programme operated by the Department of the Environment, Community and Local Government in support of the voluntary and community sector. The aim of the LCDP is to tackle poverty and social exclusion through partnership and constructive engagement between Government and its agencies and people in disadvantaged communities. The Programme is being continued on a temporary basis at present while a successor programme is being put in place. by hundreds of thousands of community volunteers stands in stark contrast with the behaviour of those who have dragged the so-called Community & Voluntary Sector into disrepute. The existence of a “poverty industry” is epitomised by the salary payments by Rehab and by the company’s approach to lobbying. By contrast, most people working in social inclusion work, community work and related fields have experienced cuts to funding and to salaries (which are not high to start with). While the media spotlight is focused on the Community & Voluntary Sector, it is only beginning to shine light on a recent announcement by Government of its intention to allow contracts for community work to be open to public tender. The move has been condemned by the Irish Local Development Network and SIPTU representing workers, among others. Could the private sector help rehabilitate communities in ways that community groups cannot manage at present? One imagines the Government must believe so. In the USA, private companies run prisons profitably. Prisoners must pay for phone calls, etc. Why should the State pay, the argument goes. This publication will provide fair and balanced coverage and offer a forum for debating the issues. Keep an eye on our news blog (via our website) in the coming months. At the same time, it is widely accepted that profit-making from community work runs contrary to the principles that underpin community development since it takes community ownership away. That doesn’t mean there is not value in opening the gates to private sector companies. But a heck of a lot of people and communities nationwide remain to be convinced. Coming hot on the heels of the furore over salary payments by Rehab, one wonders about the wisdom of inviting private companies to contribute to our country’s community infrastructure. FILE A REPORT FOR US! If you enjoy writing, why not file your own report for us. 300-400 words is plenty (and a photo if possible). Well over a hundred community workers and volunteers have done so over the years. The chief criteria - you must be involved as a volunteer, worker or board member with an LCDP-funded project (check our website). Alternatively, tell us something novel about your community that others could learn from. Contact details above. Editor: Allen Meagher Editorial Team: Robert McNamara, Joe Saunders, Viv Sadd, Gearoid Fitzgibbon, Juan Carlos Azzopardi, Grainne Nic Dhonnacha and Allen Meagher. Packing and Distribution: Speedpak, Dublin, an awardwinning social enterprise. Printed by: Davis Printers, Limerick. 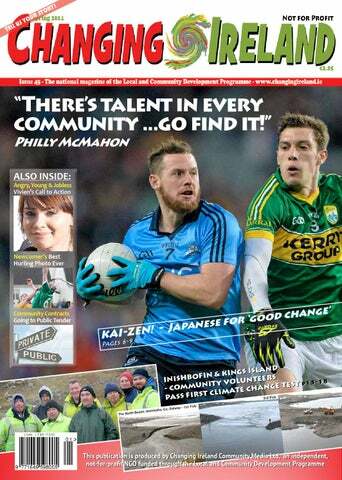 ‘Changing Ireland’ is the national magazine of the Local and Community Development Programme and is managed and published by Changing Ireland Community Media Ltd. through funding from the Department of the Environment, Community and Local Government. Postal address: ‘Changing Ireland’, c/o Community Enterprise Centre, Moyross, Limerick. Voluntary Board of Directors: Kay Flanagan, Viv Sadd, Ellen Duffy, Ali Rabiya and Gearoid Fitzgibbon (chair). Office base: Unit 3, Sarsfield Gardens Business Centre, Sarsfield Gardens, Moyross, Limerick. ‘Changing Ireland’ thanks everyone involved in the production of Issue 45. The views expressed in this magazine are those of the author concerned. They do not, by any means, necessarily reflect the views of the editor, the editorial team, the voluntary management board of Changing Ireland Community Media Ltd, or the Department of the Environment, Community and Local Government. dismantled, it may be more difficult for Government to get the local activation it requires to implement social inclusion policies on the ground. Also given the controversy around the charity sector and the so called hybrid model of private companies who get public money, the LDC sector is one which has been highly controlled and is accountable to the Government in its present format. Remember, LDCs were set up by communities and people are not just clients - they are members of the same community. Community development is about people and social interventions that can be transformational. All companies will attest to people who have told them their lives have been changed for the better. Some are predicating that if the worst case scenario happens then communities will develop similar structures again in the future, but there will be regression in the meantime. range of community services and the Jobspath is a signal of that and we would see it as being a threat to the Local Employment Services. “It is still not clear what changed between the roll out of the 2007 LCDP programme and the upcoming one to necessitate it going out to tender and we would feel that it goes against the ethos of community development which will never put people before profit. “SIPTU have commenced a campaign on behalf of its members which will lead to the Labour Relations Commission whereby the Department (as well as the LDCs) will be requested to sit down with workers and discuss the issues of concern to them,” he said. He said the union and its members will also mount a public campaign. Darragh O’Connor was interviewed by Robert Carey. Robert Carey works for North East Kerry Development. ABOVE: Kaizen programme participants on-site. Sport can transform people and communities and can be used as a tool for community development. BELOW: The new Ballymun, pop 22,000, the same size as Sligo. Philly McMahon with participants Sean Martin (24), S the course seriously, yet had fun along the way. Many of the people I chatted to were long-term unemployed and not by choice. Some baulked at the lack of employment and education opportunities available in the area but revealed a determination to not let it get them down. “What can you do only get on with it and do your best?” said one. government CAN’T ABOLISH Community Development! 24), Sinead Neary (20) and Lisa Keenan (23) who took Photo by R McNamara. n Ballymun Regeneration has changed the landscape in Ballymun and old apartment blocks battle for the skyline with rows of smart new buildings. Just across the road from Tír na nÓg is a shiny new building that houses a theatre and a swish restaurant that is in sharp contrast to the run-down and neglected shopping centre. Perhaps that contrast informs the town’s personality, as among the urban anomalies there is a wealth of unleashed potential. This talent is ready to be harvested for the benefit of the immediate community and the rest of the country. It’s programmes like the LCDP-supported ‘Kaizen Evolution’ that are facilitating that. Many here have triumphed through adversity like Philly McMahon, but so many more would take the opportunity if there were more programmes geared towards further education and employment. Can the Government abolish Community Development? This is an interesting question, in the sense that community development did not originate as a government initiative in the first instance. It came out of people being convinced that building up capacities and creating the potential for full participation was necessary if we truly aspired to an inclusive and balanced society. So much so that community activists in the 1980s ‘did’ community development in what could be described as an underground, or even subversive way. Skill lay in accessing resources from State programmes (the SIS Scheme was a good example for anyone that remembers it) by making the right proposals and filling in the forms “correctly” when reporting on activities. policy? However unclear the outcome in this respect, there is clarity in respect of the inherent contradictions at the heart of current government policy: . A well-developed and effective community development infrastructure is the result of investments over two decades. It makes no economic sense for the State to tear this apart now – especially as the entrenched inequalities being steadily developed will eventually require a reconstruction of the same infrastructure. aspirations 2. The Government has stated aspirations towards ‘civic engagement’ and ‘active citizenship’. How? Using what mechanism? The policy goals are admirable, but the unavoidable result of policy initiatives will be civic engagement for some, complete disengagement for others, and passive citizenship for all. 3. Limiting policy to short-term fixes and reactions has definitely closed debate on the long-term economic consequences of dismantling community development. Inequality certainly comes at a cost, but few want to think about counting it right now! Brian Dillon is a community worker and researcher employed through the LCDP with Tipperary Rural Travellers Project. LOCAL FOCUS - BRAY, CO. WICKLOW Would you wear a Onesie to work? Children from Bray Area Partnership’s community pre-school, Fun Dayz, celebrating the service’s fifth birthday and National Pyjama Day with with manager Teresa Grant (l) and assistant manager Elizabeth Frawley (r). They joined 40,000 children and staff nationally who took part in National Pyjama Day on March 7th. Day is run by Early Childhood Ireland, whose members in pre-schools and childcare services nationwide support over 110,000 young children and their families. In Bray, the children and staff were also celebrating the fifth birthday of Fun Dayz. The Quinsboro Road-based service is run by Bray Area Partnership, who set it up five years ago as a community pre-school after another preschool on the site closed after many years. can be done about them. Older people, carers and people who provide services to older people were invited to attend. The “TDs Forum” is being organised in collaboration with a group of local people aged over 50 who took part in the recent Community Effects active citizenship course run by BAP. For more info, contact BAP’s Eileen Byrnes. T: 01-2868266. Older people in Bray at a meeting last November. Participants who took part in a recent mental health training workshop in Bray designed to support workers and volunteers involved in supporting young people. not even old enough to vote. I am angry that people on the live register- mainly the youth, get judged for being in this situation. I am angry that they are being told to sit down and accept 64 euro a week. I concede to the reality that there are many people out there who make receiving social welfare a lifestyle choice, but what about the people who want a job? The people who want an education? The people who want to better themselves? The people who want to upskill? What about the lost ones? The people swindled out of a steady future? The people robbed of a chance? The people begrudged hope of a better time? “We the people truly do not know the power we hold” We the people truly do not know the power we hold. This article is not intended as another tedious piece complaining about how inadequate the shower up in Dublin are. Because let’s put things into perspective here; our fair isle will improve. Throughout our history we have always come back from hard times and we went on to prosper. We are slowly but surely getting back on our feet. The youth need to step up and be the change they wish to see. Let us not stand for this economy, let us help ourselves. The key to improvement lies in education, training, entrepreneurship and the creation of jobs. have a British band ring in the New Year in Dublin. It was an absolute Ska-ndal and not so much the straw that broke the camel’s back as one-step-beyond. Cocky Corkonians Interesting watching the documentaries on two Cork sporting legends Keane and O’Gara - they said the fear of failure was the driving force that made them winners. So, Cork people (yes, dear editor) don’t really believe they’re great, they’re just afraid everyone will think they’re crap and hide it by acting cocky. German GAA The influence of Germany is allpervasive in Ireland and now even the GAA has been infiltrated, what with referees brandishing red, yellow and black cards - the colours of the German flag. Mars mission takes emigration too far This new mission to Mars should be lead by an Irishman as this is the ultimate act of emigration, going far away without any intention of ever coming back. should help ourselves too A large amount of 18 to 25 year olds do not even vote. Those who do not vote have no right to complain about the state of the government. Those who do not go out and actively pursue a job do not have the right to claim from the social welfare. We are the future; let’s make the future bright for our generation and generations to come. Action Project set up by Wexford lynn, Co. Wexford, has a Certificate work experience last year with ently on a further work placement, assistant and as a waiter. keen TDs were to listen to our opinions regarding changing the way of life for the youth. We met with many TDs including Mick Wallace, Paul Kehoe, John Lyons, Brendan Howlin and Michael D’Arcy. All of whom gave us feedback on the project, lent us advice on how to go about such matters and provided information on issues like The EU Youth Guarantee. Additionally the group gave a submission on how the Youth Guarantee should work to best sustain the youth. As of yet, whether these meetings will have any impact is not known to me. My generation has a right to be angry. I call upon the Irish youth to take a stand and realise that they can make a change. We do not have to accept what is happening. There are many local development offices over the length and breadth of the country that would be more than happy to govern meetings and organise youth projects where young people can talk about what to do about issues like this. The best people to make the best of a bad situation are young people. We have the most drive, we have the freshest ideas, new ways of thinking and we have categorically the least to lose. The society in which we live is a favourable one, a fair one, a democracy. Let’s use this for all it is worth. When one looks at things in a positive light, the future seems bright. In the grand scheme of things these hard times are just a ripple in the ocean. There is so much better to come. And we, the youth, are the bright future. Give us a chance to prosper. Become a development correspondent with aN unique national magazine! Pay per article. free professional media skills training & mentoring. If you wish to develop your communications skills, If you work or volunteer in Local and Community Development, If you have a nose for news, have community at heart and have a way with words, then contact the editor, Allen Meagher. E: editor@changingireland.ie T: 061-458011. A weather forecast like we’ve never seen before. Times are changing and communities need to become more resilient. In Limerick, on February 1st, the River Shannon and Abbey River burst their banks and a major residential area of a large Irish city was hit by a “Tsunami-like surge of water” that flooeded hundreds of homes and terrified thousands of people. Meanwhile, off the coast, Inishbofin was being battered like never before by Storm Darwin. A pier was destroyed and roads and a beach devastated and this on top of storm damage caused over Christmas and the New Year. To add to people’s woes, there was no immediate response from local and central government. And so, communities took matters into their own hands. left has been boarded up for six years. The house on my right has been boarded up for nine years. The water’s still inside those houses and it’s seeping through the walls into our house. “We’ve no heating system in the house, we have only have a fire in the sitting room and we’ve a bed in there to keep warm. It’s a terrible thing to say, because my daughter has a lung infection.” Neighbours had provided coal and timber to burn to keep a fire lit, but it wasn’t enough. The family was burning clothes to keep the fire going during ‘Changing Ireland’s visit. In both places, a community development infrastructure is well established and community workers played an integral part in the recovery. Inishbofin Development Company was established in 1993 and, while the Irish economy boomed, it was to the forefront in improving the island’s infrastructure from piers, roads and an airfield to childcare facilities. (The Government, is this year putting the airfield up for public auction, having abandoned interest in the project). The company is funded by the Local and Community Development Programme, through a service-level agreement with Comhar na nOileáin Teo/the Irish Islands Federation. A range of community groups operate on King’s Island, including the local office of Limerick City CDP, also funded by LCDP funding (by way of an agreement with the city’s PAUL Partnership). There is also St. Mary’s Aid and other groups. Since Storm Darwin, benefit gigs have been held in Limerick and Galway cities to fundraise for King’s Island and Inishbofin respectively. Communities as far away as Dublin and Monaghan have pitched in with collections and donations. People in both communities will tell you they never want to live anywhere else. St Mary’s Park on King’s Island was included in Limerick City’s Regeneration Plan, since downscaled, and both communities are designated as officially disadvantage compared to other places in Ireland. A team of volunteers worked for ten days to restore the North Beach, Inishbofin. Simon Murray is first on left. People were able to rally more quickly due to the pre-existing local community infrastructure, long established on the island. Photos copyright Marie Coyne. Communities have not lost the capacity to act and change things themselves. “There’s a 75 year old man who lives across the road from me; he had his boat out 8am to 8pm to help people get out of their houses,” said CDP volunteer Geraldine Reidy. She said search and rescue volunteer teams came from counties Clare and Limerick, but it was “a while” before they saw council workers or councillors on site. “People in Abbey View, the Lee Estate, Astin Park didn’t even look at the damage to their own homes and instead came down here straight away to help everyone in St Mary’s Park because they knew we were in worse state than them,” she said. “It’s a credit to all the people who have worked so hard, 16 hours a day without fear or favour. They have encountered water up to their necks,” said John Costello. The local Star Rover’s Football Club became a central point for taking in emergency supplies of food, medication and clothing, entirely under local co-ordination. Urban horse-owners proved their worth in the floods, rescuing over 100 people. The clean-up continued for many days afterwards. In his St. Patrick’s Day message, President Michael D. Higgins praised the “spirit of friendship and generosity” shown by Irish people during the recent bad weather. Certainly, there is a stronger sense of community on both Inishbofin and King’s Island since the storms, but what has been learnt? Simon Murray said islanders always look to themselves first and foremost to keep the island sustainable. “Certainly, the work restoring the beach boosted community spirit and there’s an even greater determination now among the community now to fix problems. “We’re fairly close as it is, but sometimes I’m amazed at the capacity of the community. It plays on your psyche that there are very few people on the island and everybody’s got to get on.” “The recession’s been good for one thing - it’s breathed a bit of life back into communities, people are re-evaluating how they live their lives.” He said that in an emergency all communities must be ready to take action themselves, that it was lunacy not to. On Inishbofin, of a labour force of around 60 or so “we probably had 30 people at least involved in the project”. “We had to start locally at volunteer level because we knew straight away there wasn’t any hope of outside help,” he said. “In the long-term, if the Government is going down the road of public tendering for local and community development work, I don’t see how it will work. A private company would have no community structure or approval. Tendering could destroy the community development ethos. Our whole model is based on bottom-up, community-owned, community development. Both communities now depend on large plastic bags filled with sand to protect a halfdozen homes at the East End, Inishbofin and hundreds of homes across King’s Island. Housing Minister Jan O’Sullivan said approx €100k had been dispursed to needy families. However, as desperate mortgageholder, 33-year-old Dr. James Ring from Athlunkard Street, Limerick, wrote, “What good are appliances and furniture in a house with no internal walls and without power or heat?” He had been unable to get home insurance and his home needed an estimated €40,000 - €50,000 to make it habitable once more, money he did not have. “The authorities need to get their act together and listen to what the people are actually telling them,” said CDP volunteer, Geraldine Reidy. “I talked to (Ministers) Jan O’Sullivan and Joan Burton about the psychological damage. People are worried about their children, they’re having nightmares, trampling though the floods, losing homes, losing their possessions,” she said. It is of little interest to such cash-strapped residents that many of the community groups that took immediate action to help people in the community receive government funding. “Galway County Council had a five-man crew here until 2008; now they only have one worker on the island. One man can’t buttress a road on his own,” said Simon Murray, shortly after Storm Darwin hit. “The Council should hire a local crew again on short-term contracts because they could start work immediately. It shouldn’t be complicated, we’re not building anything new, just conducting repairs. “If they go down the tendering route, that process is expensive and takes months or even years, because they’ve to carry out an assessment, draft a tender, advertise it, agree a contract and eventually a contractor comes on site. to the overall success of Regeneration in Limerick,” she said. Course director Bernie Quillinan echoed the Minister’s sentiments and welcomed the coming together of dozens of community groups in designing and delivering the project. All in attendance agreed that the programme will not only be a positive development for St Mary’s parish, but that UL will reap rewards from such positive community engagement. Carmel Duggan, chairperson of the Kings Island Community Centre, expressed hopes at the launch that the initiative would help stem the problems of unemployment and early school leaving in St Mary’s. “We’ve been brought into this as the first community in the country and I think there are now great expectations for the future of St Mary’s Park,” she said at the time. The CWELL project runs for two years and is being supported by Limerick City Community Development Project (LCCDP). For more information, contact Geraldine Reidy, St Mary’s Office, LCCDP (T: 061 411 076) or course director. T: 061-213523. E: Bernie. Quillinan@ul.ie. “Planning and building are just one element of Regeneration,” said Minister Jan O’Sullivan at CWELL’s launch. Also pictured: Bernie Quillinan, UL, Course Director, and Tony Ryan, Katie Daly’s Bar, Nicholas Street, Limerick. DUBLIN to get ‘COMMUNITY COURT’ The Government has agreed to a Department of Justice proposal to establish a pilot community court in Dublin city centre. A report by the National Crime Council first suggested such a court in 2007 and they already operate in the US and Britain, although one in Liverpool shut down recently, reportedly due to high costs and low outcomes. The crime council suggested a community court could work with people accused of disorderly conduct, being drunk in public, illegal street trading, theft, drug-use and handling stolen property, as well as certain assault cases. Community courts are common abroad. In a Seanad debate, Fine Gael’s Martin Conway proposed that a pilot be established, saying a community court could be “part of an overall onestop shop, to ensure people who find themselves before the court can get immediate remedies”. He suggested it could be co-located with counsellors in anger management, drugs and alcohol addiction, community employment, welfare, family disputes and parenting courses. He said the community court would be a form of “early intervention” within our justice system. Senator Ivana Bacik referred to Irish Probation Service recommendations to keep costs low, by using existing District Court structures and procedures and by limiting the pilot court to offenders who pleaded guilty to summary offences only. Senator David Norris also welcomed the proposal, noting that the reason most people were in prison was “a question of poverty”. Since 1999, a pilot project in restorative justice has operated in Nenagh, Co. Tipperary. Offenders are provided with a means to make reparations to their victim or the community. W: nenaghreparation. com Brehon laws in times past also operated as a form of community-administered justice. 800 students complete music programme - LOUTH LEADER PARTNERSHIP Over 800 students and teachers from seven primary schools across Co. Louth took part recently in an innovative musical programme. Music Generation Louth received support from Louth Leader Partnership to run the ‘Music Matters’ early years programme. The philosophy behind the initiative is that all children are born musical and have a right to a high quality musical education that ideally starts in the early years. Is this Ireland’s first rooftop community garden? Galway City Partnership opened the garden last summer. ways. The project organises a parent and toddlers group, a camera club, supports lone parents, affordable dancing classes and supports everyone from immigrants, to men and lone parents. Unemployment is high in New Ross and the CDP receives solid support from many local businesses to fund activities. Training and Transformation books and resource material are now available for sale from Partners. W: www. trainingfortransformation.ie T: 01-6673440. 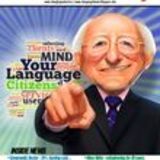 WIDEST REACH BEST PRICES Summer edition out late May 33% discounts for non-profits SPECIAL SUMMER SALE ADVERTS FROM €100 Contact the editor, Allen Meagher. Community workers from Limerick City Community Develop women from across ment Project helped the city together to cel bring hundreds of ebrate International Joan Keehan, Kay Women’s Day on M Flanagan, Mary Fit arch 8th. Pictured: zpatrick, Helen Fla involved in organisin na gan and Geraldine g the event were Lim Clohessy. Also eerick Women’s Netw ork and Moyross Resid ents Forum. Dubliners have the opportunity now to do a university course through their local library and without the need to do exams or projects. The ‘Communiversities’ programme was set up by Northside Partnership, NUI Maynooth and Dublin City Council Library Service to offer adults the chance to try education at this level without the pressures associated with assessments. Places were limited with priority going to people who are long-term unemployed and groups supported under the Local and Community Development Programme. For more info, contact Paul Hayes. E: paul.hayes@nspartnership.ie T: 01-8485630. In Galway, local community workers are opposed to the tendering out of community contracts to private, for-profit companies. They argue, as do other local development companies through their umbrella group, the Irish Local Development Network, that it undermines decades of work and will not save money. Anne-Marie Fleming is one of two students due to take up a twoweek work placement at the Royal Botanic Gardens, Kew, London. people who I am happy to call my friends and have had one of the best experiences of my life,” she said. She would “very highly recommend” the course to others. Maurice Stenson, manager of Belvedere House, Gardens and Park, credited the “excellent working relationship” between themselves, the local authority and the local development with making the course a success. The Level 5 FETAC course covers plant science, soil science, plant identification and use, fruit and vegetable production and much more and the organisers are currently recruiting for the next programme starting in May. For more information, contact: Majella Maher, coordinator. E: mmaher@westcd.ie M: 087-7923349. Also see Kevin Bray’s full article on: http://bit.ly/1hG1vMU The course is delivered under Local and Community Development Programme goals 2 and 3. FORGIVE US! we’ve turned shy, QUIET people into dynamite djS - The true value of community radio in Athlone by darragh clifford cronin DCC: How does someone’s involvement with in community radio improve their life-chances or outlook on life? Mary Lennon, station manager, Athlone Community Radio: I’ve several stories. We’ve had a lot of highlyeducated, young unemployed people who learned skills here and went on to find work in community radio, in mainstream radio and elsewhere. We have young people who decided to go back to college and study media after being with us. We have people who have been isolated, but through Athlone Community Radio they found something they can get involved with and can work with and feel part of it. The social outlet is an important part. It would be very hard for me to just pick only one volunteer because with all of our volunteers they’d tell you that being involved with the community radio project has been life-changing in that it has opened up new life chances for them, new areas for them to explore, its allowed them to develop skills, to showcase their creativity and their talents. People here have written plays, songs and poetry. People have come in behind the microphone who the first day they came in and the first thing they have said is ‘I’ll make the tea, I’ll answer the phones, I’ll do whatever, but I won’t go behind the microphone’. Before you know it, they’re behind the microphone presenting a programme. So one of the greatest things in this community radio station is that it builds confidence and that is life-changing for everybody. DCC: What attracts volunteers? ML: Their belief in community, to learn new skills such as broadcasting, to be involved in making programmes. Others come for the social outlet, to make use of skills they have and to have their voice heard. People make programmes that highlight issues for the community. DCC: What is the greatest value Athlone Community Radio added to communities in its listnership area last year? ML: The station provides a platform for all other organisations and groups to come in and highlight what they do and discuss the issues that are importance to the community. We showcase talent and highlight the good things in the community, because very often it’s the negative things that are broadcast. The station is owned and driven by the community and it’s there for the needs of the community, It’s really important that people in the community know the project is theirs to be involved with, theirs to be organised and theirs to run. DCC: What is the greatest challenge for your station this year? ML: Community Radio is not-forprofit and the biggest challenges for us are funding, insurance and overheads. Being a voluntary organisation, we’re dependent on the community for fundraising and advertising revenue. Another challenge is keeping our programmes fresh for the listenership. DCC: What are your ambitions? ML: We hope to expand our schedule. At the moment, we broadcast for 36 hours a week and we’re hoping to push that out and start each day with a strong community-based morning programme. We also want to grow our volunteers and keep people coming through and to provide training through CRAOL, with whom we have a FETAC accredited course. That enables us to provide high quality training that results in good quality programmes being made. Editor’s note: See our Winter ‘13/’14 edition to learn more about community radio in Ireland. Athlone rep to chair CRAOL Conference Irena Cvetkovic, Athlone Community Radio, will chair the annual conference of the community radio network Craol where keynote speakers Vincent Browne, Harry Browne and Frank Connolly will debate the media’s influence on our political views. Also participating are Emer Costello MEP and possibly a Fine Gael minister. Venue: Teachers Club, Parnell Square, Dublin. Registration via: http://nearfm.ie/ mlconference/ Date: March 29th. Mairead O’Connor interviews a young listener, or as she put it herself - “Over-zealous reporter attacks young child with microphone.” The photo was taken in Athlone Community Radio’s first year. It celebrated its third birthday in January.